The all-new storyline begins here! 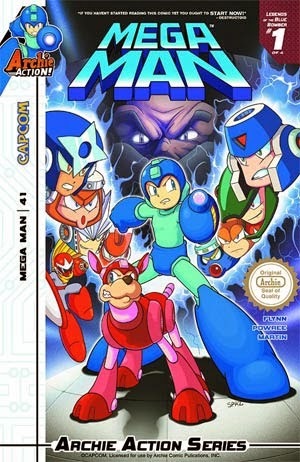 The epic adaptation of the legendary game, Mega Man 3, begins with 'Legends of the Blue Bomber' Part One: We've seen Mega Man battle Robot Masters plenty of times before, but now witness the mechanical madness unfold as only the Masters' masters see it! Get a birds-eye view of battle from the lens of the great (and not-so-great) Doctors that have created our heroes and menaces! But how is this all playing into Dr. Wily's hands? Find out in this battle royale you definitely won't want to miss out on! Featuring new cover art from Patrick 'Spaz' Spaziante, plus an awesome 'movie poster' variant from Vince Riley! About time, right? Look forward to it! That's fantastic! I am really looking forward to this! I just really hope there are no delays. These past few months have been awful when it comes to release dates. Oh boy I can't wait for another four months of Robot Masters dying in two pages while they plug their reprint magazines they can't even bother to publish because they're so far behind in printing. But it's cute that you think there's only one person on the planet who dislikes these comics. Yeah, s'not like you're infamous for going into EVERY GODDAMN THREAD on Archie-MM with the express purpose of shitting on it, and how the people that folks mistake you for tend to sound exactly like you. Because obviously nobody can hide behind an anonymous name for the purpose of baiting people. Argh, while I'm happy that we're getting to 3, I was hoping we'd avoid these new covers with the new branding like Sonic was getting. Hopefully they'll learn that it's not necessary and give us back proper covers without the 'Action' branding. 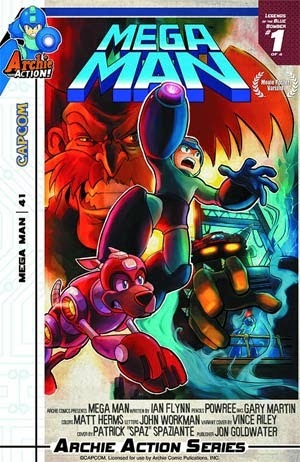 Finally they are getting to Mega Man 3. Hope there isn't a longer waiting period until they get to MM4. Talking about Ra Thor, what happened to him? He was only knocked out in battle, so is he working with Wily's robots, or Wily decided to not repair him? Although Ra Moon controlled him, isn't he still loyal to Wily like the MM3 bots? Or was he completely brainwashed?